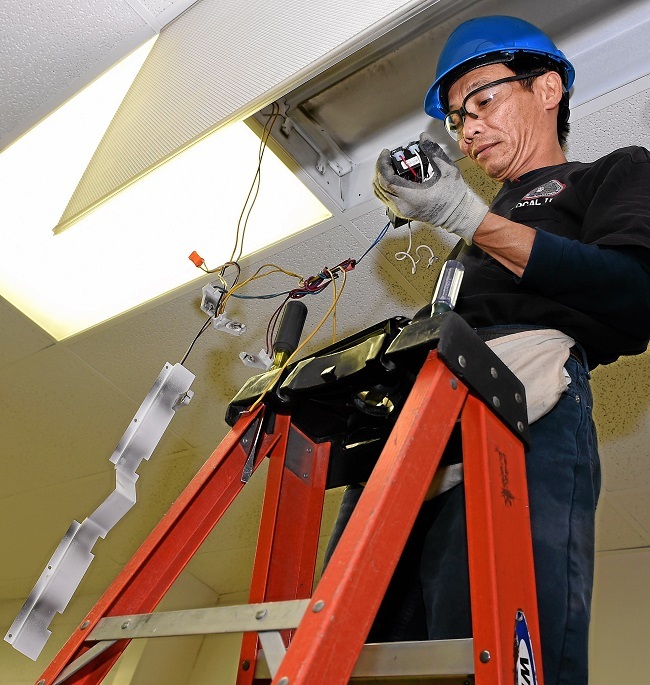 Duy Ha installs new lights, ballast system, and motion sensors at La Puente High School . Who knew changing old lights and turning them off when you leave the room could save $543,692 a year? It’s a lesson that the Hacienda La Puente Unified School District has learned over the past year. It saw big savings when it hired Schneider Electric to redo the lighting at Orange Grove Middle School and Cedarlane Academy in Hacienda Heights. Now, it’s spending $6.75 million to modernize the lighting at its biggest energy users, the four high schools. The district figures the changes will cut the district’s electric bill by 14 percent. Fortunately, Hacienda La Puente Unified was one of the first school districts to apply for funding from Prop 39. In 2012, California voters approved the proposition to invest $2.5 billion in energy efficiency projects at schools and community colleges. “Among the 1,000 plus school districts in California, we are one of the larger school districts, and one of only 47 districts with an approved Prop 39 plan,” said School Board President Gino Kwok. The district’s Prop 39 project has been approved by the California Energy Commission for the entire five-year program. It will receive an estimated $4,435,680. Contractors have already redone the lighting at Willow Adult Campus in La Puente, as well as district’s offices. Now, workers are shifting to the four high schools. “These six sites use approximately 47 percent of the district’s total energy cost annually,” said Maintenance Director Mark Hansberger. Improvements include new classroom lighting as well as sensors that turn off the lights when no one is present. Work crews will also install LED lighting on the exterior and in the gymnasiums, plus new heating and cooling controls. Read more in Rich Irwin’s story LIGHTS. Wilson High School held its third annual Arts Showcase on Wednesday from 3 to 7 p.m. in Hacienda Heights. The showcase offered performances from the band, drama department, choir and color guard. There was also a Fine Art and Photography display in the Den. The local high school also had a dessert food truck, as well as other food vendors throughout the afternoon and into the evening. The Wildcats roared proudly Monday evening. Nearly 400 Wilson High graduating seniors celebrated during the school’s commencement ceremony, held at the on-campus football stadium. Valedictorian William Chen, who compiled a GPA of 4.83, will study chemical engineering at Harvey Mudd this fall, while salutatorian Sarah Hsu is heading to Brown University in the fall to study medicine. See the photo gallery at WILSON.